Roads often present peril for wildlife - but with good planning, they can benefit animals instead. May 19, 2017 — Late last August, armed with a sweep net and identification guides, Sarah Piecuch was looking for butterflies. She trudged through waist-deep grasses, trying to keep her footing steady while tallying those she found fluttering through the sky or perched on nearby flowers. But Piecuch isn’t an entomologist, and she wasn’t walking in a pristine meadow. Rather, she’s a wildlife biologist for the New York State Department of Transportation, and she was surveying the land beside busy highways in hopes of learning what kind of management can make these long, thin strips of habitat most beneficial for pollinators. Her work is just one of a number of projects across the country aimed at using the space along interstate highways to help wildlife. In 1956, the U.S. Congress passed the Federal-Aid Highway Act creating the nation’s interstate highway system. This legislation connected the country, creating a web of freeways that now totals some 47,000 miles — nearly enough to circle the Earth twice. Construction of the interstate system allowed for efficient, fast, and safe car travel, making it easier for people to commute and transport goods. The establishment of the interstate highway system didn’t just connect the contiguous United States, though. Inadvertently, an entirely new place was created as well: the highway right-of-way. Also known as the verge, the right-of-way was originally just the linear boundary between roads and other land uses. Yet how people view and manage the verge has markedly changed over time, creating a physically distinct space to manage and eventually an ecosystem unto itself. The interstate highway system that was so successful at connecting people and cities across the U.S. meant big changes for nonhuman life also. If properly managed, roadsides represent a relatively open habitat that could benefit a variety of species of conservation concern.“Roads represent one of the biggest threats to wildlife for a number of reasons by causing direct habitat loss and habitat fragmentation,” says David Steen, a wildlife ecologist and conservation ecologist based at Auburn University. Researchers have found roads to harm wildlife by blocking their movement and causing deaths through collisions. “Wildlife can also be harmed indirectly, by noise pollution from traffic, runoff from deicing chemicals and altered microclimate conditions along roadsides,” Steen says. Yet there may also be opportunities to harness the network of highway systems across the country to help animals migrate and connect habitats. Road ecology, a fairly new and growing field, focuses on life in and on the edge of what can perhaps seem like an uninviting place for wildlife. If properly managed, roadsides represent a relatively open habitat that could benefit a variety of species of conservation concern. Cora Lund Preston, who works with the conservation partnership Monarch Joint Venture, calls roadsides “a huge opportunity in a dramatically changing landscape.” Her organization is part of a recent initiative to turn the roadsides along Interstate 35 and the surrounding area into a migration corridor for monarch butterflies. Every fall, monarchs migrate south to escape cold temperatures and hibernate through the winter, then begin the journey north again in the spring. Interstate 35 runs north-south from Minnesota to Texas, roughly along a major existing monarch migration flyway, and the six states along this highway last year signed an agreement to collaborate on the corridor effort. Monarchs need milkweed as caterpillars and nectar from flowering plants as adults to fuel their migration. “Roadsides can provide both milkweed and flowering plants if wildflowers are planted and encouraged,” Preston says. This is especially important in areas such as the Upper Midwest that are losing habitat that previously had more milkweed and flowering plants. The conversion of agricultural production to herbicide-tolerant row crops has led to fewer of both in a region that doesn’t support many other kinds of habitat. However, the jury is still out on whether the interstate roadside will provide high-quality habitat for monarchs and help increase their population. Highway roadsides have not been managed as a flyway at the continental scale before, and a recent study on the suitability of roadside habitat for monarchs by the Monarch Lab at the University of Minnesota gave mixed results. 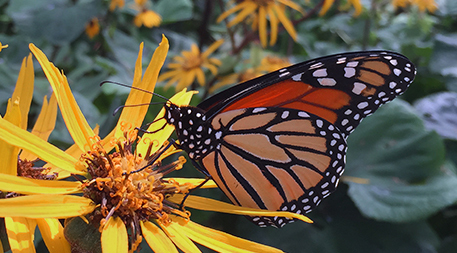 “Monarchs of all life stages were found and able to fully develop in roadsides,” says Kyle Kasten, a senior technician in the lab and lead author of the study. “Roadsides are contributing to monarch conservation, but we found they were inferior to other habitat types, such as prairie remnants and backyard gardens.” More research will be needed to determine whether traffic noise, road runoff and other potential stressors can be mitigated in roadsides managed for monarch conservation. Roadside conservation need not be limited to interstates and terrestrial animals, though. All told there are more than 4 million miles of roads in the United States, the ubiquity of which presents both challenges and possibility for aquatic life as well. 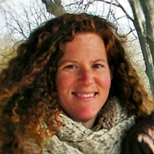 “In the Great Lakes region alone, there are at least 250,000 road-stream crossings impacting small streams and freshwater organisms,” says Stephanie Januchowski-Hartley, a postdoctoral researcher who studies freshwater conservation in the Laboratoire Evolution et Diversité Biologique at Université Paul Sabatier in Toulouse, France. Building roads leads to the construction of culverts and other infrastructure to change and control the water flow near roads, which can obstruct fish migration. 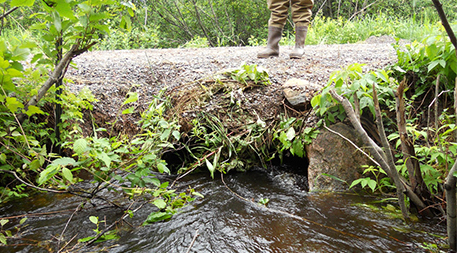 Shallow streams and standing water along roads are often buried, or culverts are installed at heights that prevent fish from being able to disperse through them. While roadside ditches may not look impressive to travelers driving by, recent research has discovered how important they are. Oele also found that invasive fish, including round gobies and sea lampreys, use ditches to migrate. Yet native fish travel farther, making the role of connected roadside corridors even more important. Januchowski-Hartley is optimistic that roads can be part of the solution to conserve native fish going forward. “Roadside ditches could be managed to restore suitable habitat for native fish species, like adding native vegetation,” she says. Indeed, the work of Oele, Januchowsky-Hartley and others could be used to identify and prioritize roadside ditches already known to be used by native fish, and then develop and restore routes that connect them. 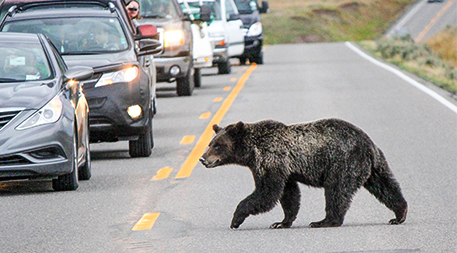 Even grizzly bear biologists are looking at incorporating roadsides into wildlife management. “Grizzly bears technically don’t migrate, but do move to seasonally available food sources within their home ranges,” says Clayton Lamb, a wildlife ecology graduate student at the University of Alberta. As grizzly populations grow, they are expanding beyond core habitats like Yellowstone and Glacier national parks and reclaiming more of the Great Plains habitat they historically occupied. And their home ranges are enormous: “as much as 2,000 square kilometers” (700-plus square miles), Lamb says. As grizzlies move through those large tracts, they inevitably encounter roads. “Primarily we consider how to get grizzly bears away from roads as best as possible,” says Matt Hart, a conservation writer for Vital Ground, a nonprofit that works on conserving grizzly bear habitat. However, Hart acknowledges, this isn’t always possible. Roadsides can provide easy food resources for grizzly bears in the form of berry plants that thrive in disturbed areas. As a result, they are a significant cause of grizzly bear deaths, through direct collisions with vehicles. Yet Lamb is convinced that some roads can be part of a multifaceted approach to support the wide-roaming movement of grizzly bears.“While there is a need to reduce roads in sensitive bear areas or where human-caused mortality is high, roads with limited traffic can be great for bears, providing both food and efficient travel routes,” he says. Lamb advocates closing underused roads, but acknowledges that approach doesn’t work for all roads. Some areas with active grizzly bear populations and active highways, like outside Banff National Park, attempt to mitigate potential conflicts or collisions by installing fencing along the roads. The fences prevent bears from coming onto the road itself, while allowing them access to roadside resources, and are interspersed with crossing structures. Roadsides are a novel and intriguing choice for conservation. They are primarily designed and managed for the safe and efficient movement of cars. But given widespread traditional habitat loss, open areas along interstates and smaller roads could be a creative opportunity to support migrating wildlife as land use changes. Whether and how we treat roadsides as potential habitat will be even more critical as the U.S. eyes taking on a US$1 trillion infrastructure initiative that could include highway construction and rebuilding. Wildlife could reap bountiful returns if citizens and policy-makers consider both the challenges and opportunities to decide how highway roadside management fits into conservation action plans and transportation planning. Editor’s note: Kaitlin Stack Whitney produced this feature as a participant in the Ensia Mentor Program.